Alferd Packer went down in history as one of Colorado’s most notorious – and macabre – criminals. 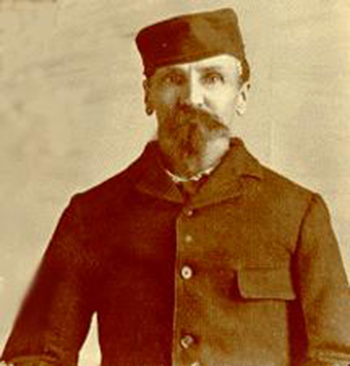 Nicknamed the “Man-eater,” Packer was tried and found guilty of eating five of his fellow travelers on an expedition from Utah to Colorado in 1874. The group originally included 21 people, with Packer acting as guide. As they worked their way toward Colorado, the weather took a turn for the worse and conditions became impassable. The majority of the group felt it unwise to press on, but Packer and five others decided to continue. It did not take long for the small group to become lost in the San Juan mountains. On April 16, 1874, Parker stumbled into the Los Piños Indian Agency near Saguache. Israel Swan, George Noon, Frank Miller, James Humphrey and Wilson Bell, the men who had been traveling with him, were nowhere to be seen. Packer was questioned extensively by the sheriff about the fate of his companions. He told the sheriff the only reason he survived was that he had eaten their flesh after they died. When I got back (Packer says he left camp to find a way out of the mountains), Bell had killed those men. Killed them. They lay around the fire, four dead men on their backs. He was a big redheaded man, and the strongest man in the party. He came runnin’ at me with a hatchet. He had the only hatchet in camp. I could see that he was mad. He made a kind of grating noise. I ran back. I had a revolver. When I got to the snowdrift, I pulled my gun. He came on the run after me, and when I got to the deep snow I wheeled ’round as quickly as I could and fired. When Packer was arrested for murder, he broke out of jail and wasn’t apprehended until 1883. On April 12th of that year, he was convicted and sentenced to death by hanging. His case was appealed to the Colorado Supreme Court, and his sentence was commuted to five counts of manslaughter, with eight years to be served for each count consecutively. Packer was described as a model prisoner who never caused any problems; he made numerous attempts for parole, still maintaining his innocence of any crime. It was not until this day in history, 1901, after he had served 17 years of his sentence that he was finally successful. Immediately after his release, he moved to Denver, but the city life didn’t suit him. So he took his whopping $25 pension and worked the two mining claims he owned in the Littleton area. His neighbors described him as a kind and friendly man. In 1907, he wrote the governor requesting a full pardon, but nothing ever came of it. He died on April 24th of that year and was buried honorably as a soldier and scout for “General” Custer. In recent years, forensic evidence has been uncovered that seems to back up Packer’s claims of what happened in the mountains during that long ago blizzard, such as how each of the people died. Further, in 1997, a curator at the Western State Museum at Gunnison, Colorado, David Bailly, found a 1862 Colt revolver in a storage closet. When delving into the weapon’s background, Bailly discovered it was from the site where Packer’s supposed victims were located. The gun still had three bullets loaded in the chamber. This could mean that Packer was telling the truth – that he had shot Wilson Bell twice, which forensic evidence backed up. Whether it was in self-defense or not is still up for debate. Thank you for this interesting and well-written story. It states, “He told the sheriff the only reason he survived was that he had eaten their flesh after they died,” but it provides no further details. I wonder if Packer revealed more about his (justifiable) cannibalism. If there was a danger of starvation, due to terrible weather and lack of food, perhaps he (1) butchered the five corpses, burying the bones and other inedible parts … (2) roasted all the “meat” … (3) ate what he could … and (4) packaged the “extra food” to take and eat on the remainder of the journey.